The Population Data Sheet offers insight on global population trends using detailed statistical information along 18 demographic, population, health, and environment indicators for more than 200 countries and regions. The data sheet is based on the latest projections of the UN Population Division. Carl Haub and James Gribble of PRB discussed the long-term implications of the data sheet’s projections during web-based launch that included open questions. “Even though the world population growth rate has slowed from 2.1 percent per year in the late 1960s to 1.2 percent today, the size of the world’s population has continued to increase – from 5 billion in 1987, to 6 billion in 1999, and to 7 billion in 2011,” write the authors in PRB’s July Population Bulletin, “The World at 7 Billion.” To put those population totals into perspective, it took from the inception of human existence until the year 1800 – a total of approximately 50,000 years – to reach the first billion. Fortunately, the recent (relative) decline in global growth rate has already curbed what could have been a considerable surge in the world’s population: “If the late 1960s population growth rate of 2.1 percent – the highest in history – had held steady, world population would have grown by 117 million annually, and today’s population would have been 8.6 billion,” said PRB President Wendy Baldwin in a press release. However, the world’s population still grows significantly at 77 million people annually, according to the UN, and we’re slated to reach 8 billion in just another 12 years. How can this dichotomy of large population totals in the face of lowered fertility be explained? “To understand global, we actually have to think local,” said PRB in their film short, “7 Billion and Counting,” released alongside the data sheet. Individual countries go through demographic transitions at different times, and the disparity in where countries are along in their progression varies greatly. 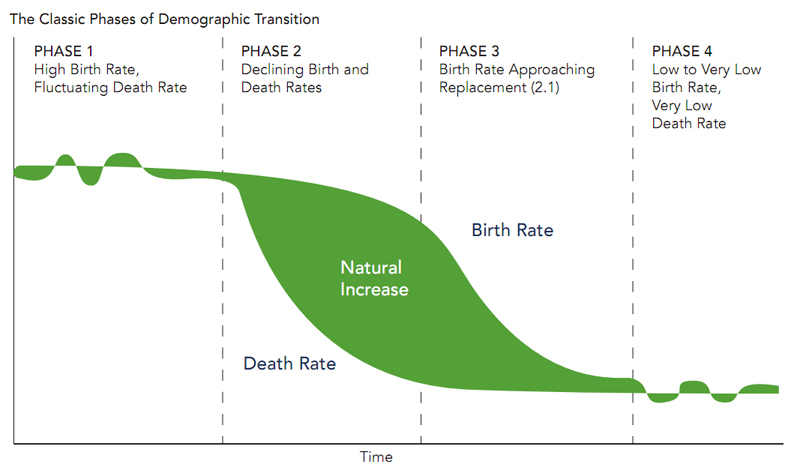 A demographic transition essentially hinges on two trends: the decline of birth and death rates over time. These trends do not necessarily change simultaneously however, resulting in most cases, first, a natural increase (when mortality rates decline but birth rates remain high) followed by a natural decrease in population (when birth rates also decline). Though the timing and magnitude of these trends differ from place to place, there are broad similarities across countries which have been conceptualized as phases by demographers, such as Carl Haub and James Gribble. Phase one is characterized by high birth rates and fluctuating death rates, found in countries such as Niger, Afghanistan, and Uganda; typically only death rates decline in this phase. Phase two, encompassing mostly lower-middle income countries such as Guatemala, Ghana, and Iraq, is marked by a continued decline in death rates but only slightly lower birth rates. The potential for large population growth exists in these countries, as they still possess a large youth population. Finally, phase four countries have the lowest birth and death rates, with some even seeing negative growth as total fertility rate falls at or below the natural replacement rate; countries in this phase include most of Europe and other developed countries, such as Japan and the United States (though relatively high levels of immigration keeps overall growth higher). The data sheet shows that most developing countries still remain in the earlier phases of demographic transition, especially those in sub-Saharan Africa and the Middle East. Relatively recent public health improvements in these countries have decreased death rates at a rapid rate, and though total fertility rates (TFR) have declined as well, they have not kept the same pace: “This lag between the drop in death rates and the drop in birth rates produced unprecedented levels of population growth,” wrote Haub and Gribble in the Population Bulletin. Poverty has emerged as a serious global issue, particularly because the most rapid population growth is occurring in the world’s poorest countries and, within many countries, in the poorest states and provinces…Relatively high population growth rates make it more difﬁcult to lift large numbers of people out of poverty. Haub used Italy and the Democratic Republic of Congo (DRC) as an example to illustrate the divide. Although both countries currently sit at around 60 million people each, Italy is only projected to grow by 2 million through 2050, while the DRC is projected to reach a staggering 149 million people. Italy has a gross national income per capita of about $35,000, whereas DRC has only $180 per capita, according to the World Bank. This observation has been corroborated by other demographers: “In 1950, 68 percent of the world’s population resided in developing regions. Today that’s up to 82 percent. But in the year 2050, it’s projected to be 86 percent,” said demographer David Bloom on NPR’s global health blog, Shots. Low development indicators do not always dictate that a country will lag in a demographic transition. “Government commitment to a policy to lower [birth rates] has succeeded quite well in countries with a low level of development,” said Haub in a 2008 PRB discussion on the demographic divide. Bangladesh and Iran are two examples of countries that significantly affected their demographic trajectories in the 20th century with targeted programs. Sources: NPR, Population Reference Bureau, UN-DESA, UNICEF, World Bank. Video and Image Credit: “7 Billion and Counting,” courtesy of PRB’s Youtube channel, and stages of demographic transition courtesy of PRB’s 2011 Population Data Sheet. The PRB Population Data Sheets are absolutely invaluable, whether it is for teaching, for engaging policy folks, or for just knocking down our many false impressions of country and region population profiles. A great service they do. Geoff – you are absolutely dead on. I am using PRB as a resource to help students understand the population variable in Amy's Environmental Geography course here at West Point. Our future leaders must understand the challenges we face, many of which incorporate population and (more importantly) consumption into solution discussions. Great to hear Wiley! That's a great course for using the datasheets. It helps to make explicit rather than just assumed an unexamined the population realities in a conversation that as you say is about the consumption AND population dynamics.